14mm rotary position sensor with 360º mechanical rotation angle (electrical angle up to 330º). - Standard, 15.000 turns, combinable with detents. - Long life, up to 1 million turns. Our 360º rotary sensor, CS14, can be manufactured in a wide range of possibilities regarding: resistance, tolerance, tapers, click effect (up to 50), positioning of the wiper, housing and rotor color. Standard taper is linear. ACP can study other special tapers, (even cut tracks, step curves with areas of constant values, etc) as well as more strict linearity. 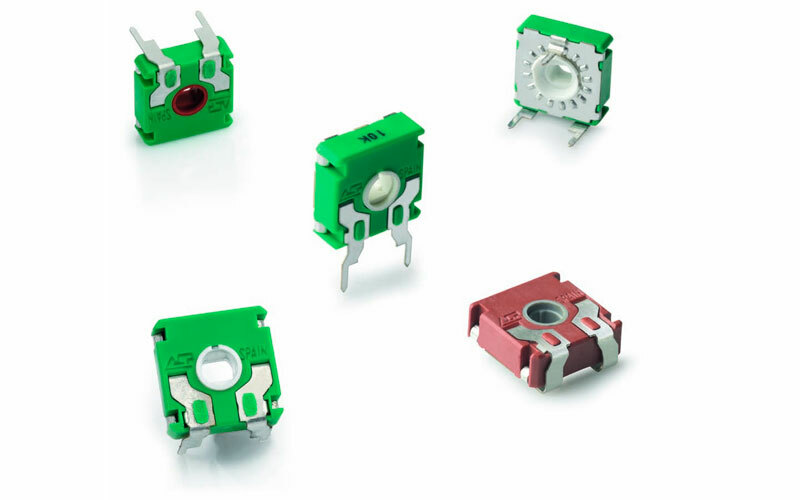 Through-hole and SMD configurations are available. Terminals and collector are manufactured in tinned brass although versions with steel terminals can be studied under request. Terminals for through-hole models can be provided straight and crimped, which helps hold the component to the PCB during soldering. CS14 has plastic housing and Ingress Protection rating type IP 54 (high level protection against dust and also against water splashing), according to IEC 60529. Plastic materials can be self-extinguishable according to UL 94 V-0 under request. Thumbwheels and shafts can be provided either separately or already inserted in the sensor. Control, function selector, position sensor for household appliances, automotive and industrial.